Do I have to have a mid-century house to use your products? Heck no. We’re just trying to make it easier for folks that are in mid-century homes to find products that better fit the style of their homes, but you sure can use any of our products on whatever type of home you have, as long as you want it to look swell! Can I buy a complete door from you guys? The short answer is “yes”, but that's not our real business model. Also, unless you’re within driving distance of St. Louis, Missouri, you might not like the shipping cost because it would have to go freight. But if you’re game, we’re game. Drop us a line on our contact form and we’ll discuss it with you. Can you help me install the door kit / install the door / make my countertops? Sorry, we are not equipped to send out people to do on-site installations. However, we’ve given you detailed instructions along with some tips and tricks and we know you can do it! Are you still wary about working with our products yourself? Find a local handyman. Ask around for references, post an ad on sites such as Craigslist or find a handy friend or relative and ply them with some beer and pizza. (A professional handyman you will have to ply with cash, just FYI.) Find more information about countertops in the laminate section. What kind payment types do you accept? We accept Visa, Mastercard, Discover and American Express along with Paypal. Everything is hunky-dory as far as security, we use all of the latest and greatest technology to make sure that everything is secure. One caveat; if you are using a debit card and have difficulties, it might be due to a limit that your bank or credit union may put on your debit card as a per day maximum. Check with the issuing institution if you have problems using your card. If you live in and/or have your product delivered to Missouri, you will have to pay sales tax. If you are in the City of St. Louis, you will also pay local tax as well. All other states are tax-free...for now. Unfortunately, this may potentially change based on the Supreme Court ruling. We'll keep you updated. Your payment is due in full at the time you place your order. We understand that once paying you’d like your product immediately (Amazon has spoiled it for small businesses) but we need to be able to take our time to handcraft the quality products you expect. I own an apartment complex / motel / multiple houses. Do you offer trade discounts or discounts for large orders? That is certainly something that we would entertain for large orders. Let us know what you had in mind (how many of what types of products, etc.) and we’ll work with you to provide you a quote. Our shipping is free on all items shipped to the lower 48 states using standard ground shipping (7-10 days after manufacturing is complete). If that’s not fast enough, we can give you a quote for express shipping. See below for more information on shipping times. I’m so excited! How long will it take to receive my order? Manufacturing can take anywhere from 2 weeks (for small items) up to 6 weeks for larger products such as an exterior door kit where we might have to wait to get a special-order shape of tempered glass fired for us. Our laminate sheets also have a longer lead time - typically 4-6 weeks, but it can take longer depending on the backlog queue at the laminate pressing manufacturer. Please know that if we can cut time from our estimated times, we’ll do it! We want you to have your new product as much as you do. If we are backlogged and think that your product will take longer, we'll be sure to let you know and allow you the chance to change or cancel your order. All of our products go out via a number of carriers, and we typically use standard shipping because of the exorbitant costs of shipping our odd box sizes. If you would like us to ship your purchase more quickly just ask, and we’ll give you a quote to cover the additional cost. Our standard shipping time is 7-10 days but again, if we can get a deal and get it shipped faster, you bet your boots we’ll do it. Do you have any products in stock for immediate delivery? On a rare occasion, we might have a sample product or a returned product that can be turned around quickly to get to you. We don’t always advertise those on the web page, so please contact us if that’s something you need (but the answer might be “no” since we have a very small space for inventory at this time). What is your return policy? What if an item came damaged? We want you to be happy with your purchase, but we know returns happen. And a damaged item? That’s a complete bummer because we try to pack each piece well. Please see our return policy here. Again, I’m excited! How will I know when my product has been shipped? We promise to send you tracking information as soon as the product has left our hands. We’re obsessive about tracking our shipments, too, so we understand! What about Alaska and Hawaii, we love mid-century stuff, too! Alaska and Hawaii residents will need to pay a slight upcharge for shipping. (We’re sorry!) Residents of those states will also have to wait a little longer, too. (We’re sorry again!) Would it make you feel any better to know that we've been to both states and loved it there? If you are in Alaska or Hawaii (or outside the United States) and would like to place an order, please contact us so that we can discuss shipping fees and final cost. I really like this door but want another lite / I don’t want a lite at all / I wish it were a little bigger / a little smaller, etc. Good news! Since all of our products are custom made for you, we can make adjustments like this. There might be an up-charge for additional materials or labor. Please go to the custom page and fill out the information including the changes you would like to make, and we will get back to you with an updated sketch of the changes and a price for your approval. I can’t find a solid core door anywhere. Can you help me? We sure can! Because this is such a frequently asked question (you know, the reason this is on the FAQ page) we've made a whole page here with places where you can buy or order a door. You might also try your local lumber yard or a Habitat for Humanity ReStore or other location that sells reclaimed building materials. Tempered glass. What’s the deal? All glazing in a door must be tempered for safety purposes per most U.S. building codes. The only exception is when the glass opening is small enough that a three-inch ball will not pass through the opening. We are strong proponents of the building code (must be the architect in us), and all of our glazing pieces (no matter the size) are tempered glass. Tempered glass must be labeled as such so all of our glass will have what is called a "bug" in the glass showing the tempering details. The bug from our manufacturer is about the size of a penny - tiny! Should I choose single pane or dual-pane glass? Really, this is your choice, but we find that even on our largest glass openings, the difference in energy loss between single pane and dual-pane is negligible. (We calculated it for one of our customers and the difference was only 38 cents a month!) We could get all mathy on you, but your eyes would glaze over. Trust us - it's not an energy decision, it's a personal decision. Can I use an exterior door design on an interior door? You sure can – just one bit of info. All of our exterior door kits are sized for an exterior door thickness (1 5/8”), and an interior door is typically 1 3/4” thick. Let us know that you would like to use a kit in an interior door, and we’ll get back to you and verify the order. Note that if you are installing into a hollow-core door, the installation can also be a little tricky because you will need to support the opening with additional blocking. Stand on the side of the door where the door swings away from you. Will your door kit be installed on the side of the door facing you? (See our illustration here). That’s the inswing side because it swings inward, against the door stop. Because the door stop is usually between 3/8” and 1/2” deep (the part that hits your door when closed) we’ll make the design that you choose 3/4” smaller on the left, right and top where it would hit the door stop so that you can still close your door. If you forget to tell us, and the design is a little too big, it’s a pretty easy fix with a saw. How do I attach the design to my door? We’ll give you directions in your kit, but here’s the upshot. (There are a lot of different variables to take into consideration, so one size might not fit all with this answer.) We will supply you with a molding and trim adhesive as part of your kit. 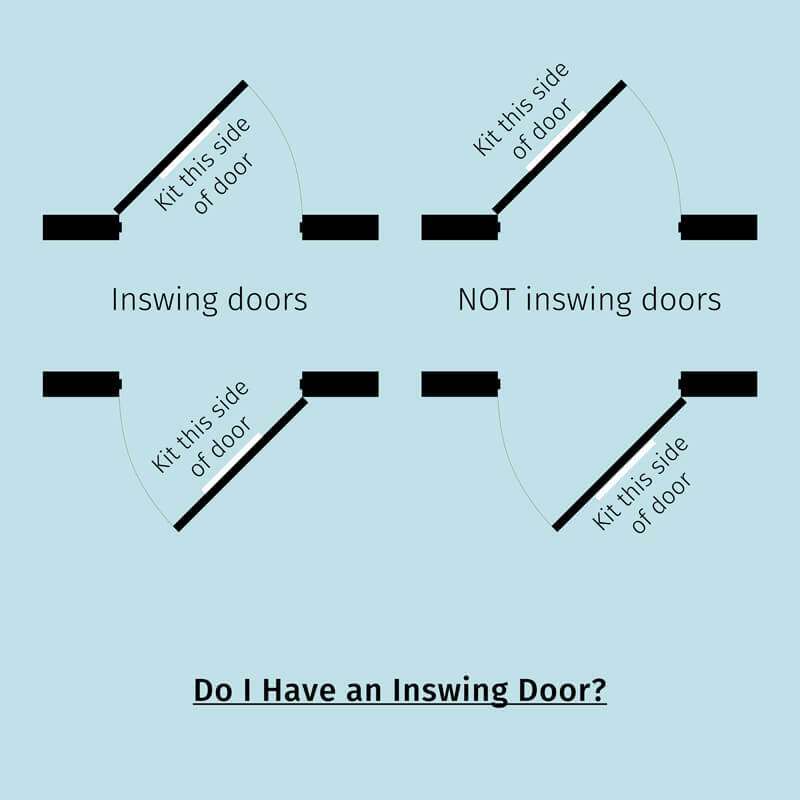 We recommend taking the door off of its hinges (if it is a pre-installed door) and laying it flat on supports and allowing the adhesive to dry thoroughly before re-hanging. (Check the adhesive label for drying times and conditions). For existing doors, you may want to rough up the existing finish slightly where you will be mounting the kit. You can paint or stain your kit before mounting if you would like, just don’t paint or stain the back to get the best adhesion possible. That's about all there is to it. I’ve got this great idea for a mermaid design for my bathroom door / a poker design for my man-cave / another geometric design you don’t offer. Can you make it? We probably can. Shoot us a photo or sketch (or both) of what you would like to do using our custom page along with your door dimensions and we’ll get back to you about any issues and a quote. We love doing custom work! Can I use an interior door design for an exterior door? Because our interior door designs are produced either out of MDF or interior grade hardwood plywood, they aren’t designed to be exposed to the elements. Paint and sealer can only go so far! However, if you have some great idea for using one of our interior door designs for an exterior door, contact us and we’ll talk! Do I have to apply the design to a door? It would look peachy keen on a wall! Heck, no! You can install our interior door designs anywhere you would like – on an interior door or a wall or wherever you can imagine, as long as it is inside, and it will be equally as beautiful. Can I use spray paint on my garage door kits? You can, although we’d recommend an exterior grade paint made to weather the elements since garage doors are so exposed. Your garage door kit will come pre-primed and ready to go for its final coat. We love Sherwin-Williams’ Emerald® Exterior Acrylic Latex Paint for your final coat, and it can be used both on the kits and your garage door. I have a flat garage door. Can you design something really far out for me even without a sketch from me? Sometimes ideas are hard to come by, so yes, we will do design work for you. We’ll need some things from you; inspiration photos, photos of your house and garage, other mid-century things that you like (or don’t). All of these things will get our wheels turning for a custom design just for you. We’ll work up some designs, get your approval and provide you with a quote. Then you will have to play the waiting game until your unique, and totally you garage door kit comes your way. Start your adventure here. I have an idea for a different design for my raised panel garage door, can you make it for me? Certainly! It all starts with you and your ideas; send us sketches or photographs of ideas using our custom page along with some measurements, and we’ll get back to you soon with a quote. How do I measure for my garage door kit? 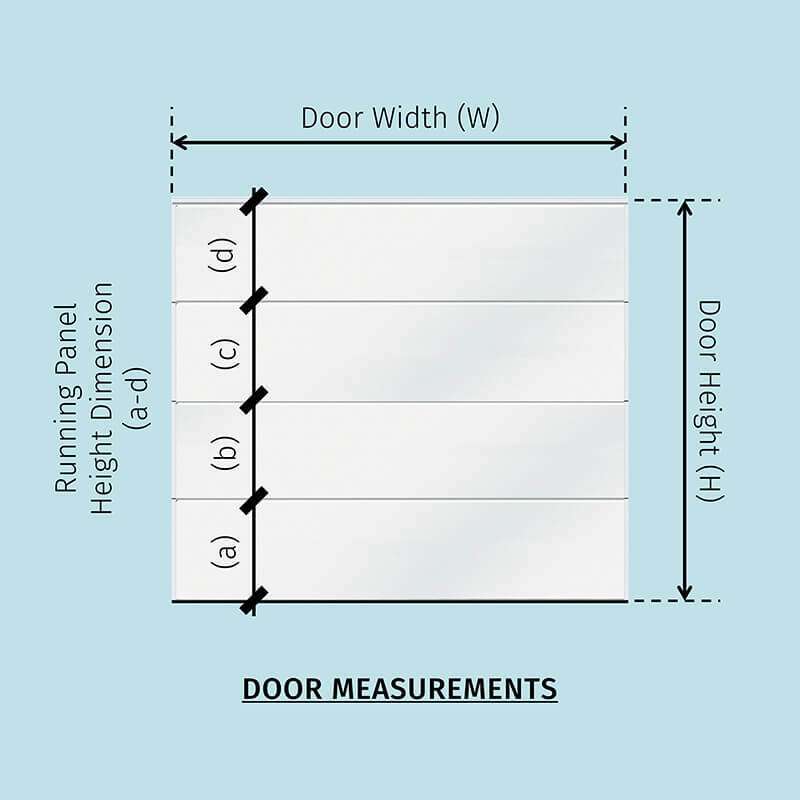 Here’s a graphic for measuring for a door kit that will fit on a standard, raised panel garage door, and here’s a graphic for measuring your door if you have a flat door and are wanting to do a custom kit. None of your standard sizes fit my windows. Is it a big upcharge for a custom size? No - it is not. 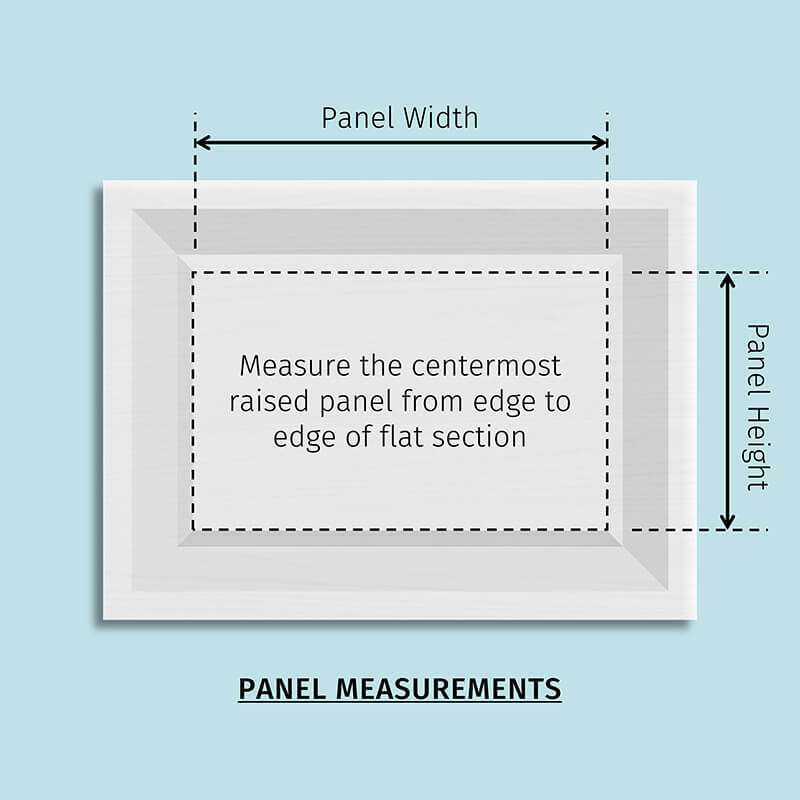 Our shutters are priced based on the amount of material and the number of cutouts on the shutter. We do not add any surcharge for custom sizes because we don't like it when someone does that to us! If you'd like a quote on custom shutters, please go to our custom page and provide us with the size, style, and material you are looking for and we'll be happy to help. I have an idea for a different cut-out that I'd like to see on my shutters. Can you help me? We sure can. Fill out out your information on our custom page including a photo or drawing of the cutout you're trying to replicate and we'll get back with you with a quote. Easy-peasy. Can you do appliques on top of your shutters? That's something we're working on with our manufacturer. It would all start with our Terry Lawrence shutter. If you're jonesing to have something like that, let us know what it is by filling out the form on our custom page and uploading a photo or image from the web and we'll get back with you on a quote. We love custom! I'd like to use operable hardware for my shutters. Can I do that? Do you offer operable hardware? Whoa! That's a lot of questions! Yes, you can use operable hardware with our shutters, and yes, we offer operable hardware for shutters including hinges and shutter dogs. Contact us for more information. Why don't you make smaller laminate sheets? Hey, we're lucky that we found a great lamination company to partner with to bring back glitter laminate at all - and they are set up for 4'x12' sheets. We can try to match you with someone else who is also looking for a smaller sheet size. Contact us with what background color and inclusion color you would like and we'll see if we can pair you up. Laminate matchmaking! I just can't imagine making a countertop by myself. Help! If countertops are out of your DIY repertoire, try finding a handyman. We suggest Thumbtack.com, HomeAdvisor.com, AngiesList.com, or HandymanConnection.com. (We are not affiliated with these companies.) If you have a complicated layout or you can't find a handyman that you trust, find a local kitchens and baths company in your area. Their expertise is - you guessed it - kitchens and baths, and they have a ton of experience in building countertops. We can even ship the laminate directly to the kitchen and bath company, which means one less step for you. Where do I get those cool, metal edges for my countertop to make it look super-authentic? Try these vendors on for size: Eagle Aluminum, New York Metals, Heffrons and Bars & Booths. Be warned that if you need a long length, you'll run up against the maximum length that a carrier like UPS or FedEx will transport and you will have to pay heftier fees for freight transport. Bars & Booths has a great breakdown of this on their website. Where did you get those fabulous vintage photos taken that are on the website? If you aren’t near the Kansas City area, make sure to check out their website as they sometimes take their photography on the road, and they might be coming to a city near you. I love your logo. Who did your business graphics? Uh, that would be Susan. She has a background in design (being an architect and all). Your website is like wow. Who made it? Liz Teresa! If you need any web design work done, Liz and her team are amazing to work with. Check Liz out on her website LizTeresa.com!